Dampus is the beautiful Gurung settlement which has faced the Annapurna Massif. Dhampus Sarangkot Trek can be an ideal trek to any type of visitors. 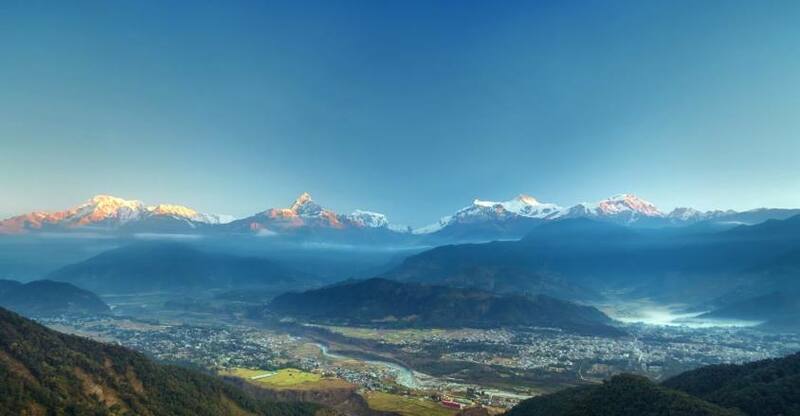 Dhampus is the gateway to the Annapurna Region, the popular trekking region of Nepal. The series of mountains, varied culture, diverse landscape, refreshing air, beautifully decorated typical stone slate-roofed houses and the paved courtyards are the attraction here. The hotel and the lodges provide the good service with fine meals. The people here are found serving in the Indian/British military and the rest of them engaged either their own lodges or doing farming. Dhampus Sarangkot Trek is fruitful, If you want to reward yourself with an easy trek, this trek is irreplaceable. For this trek is a host to the Annapurna Ranges. If you want to enjoy scenic Mountain View from a world class location, then this trek is mandatory. This trek, which demands a short getaway, has good accommodation hotel, along with its trek route. Addition attractions of this place are Buddhist monasteries and paved courtyard. You drive to Phedi via several villages then trek to Sarangkot. If you are a globetrotter, you must have heard a whisper: the best place to be in. Even if you are not, then somebody must have exuded that it is a popular rated place, after all, it is omnipresent of a picture-perfect mountain, and it fulfills your appetite. When you see these mountains, you shake off all the trickles of your doubt because the beautiful mountain scenery soaks up your mind and eyes, overhaul them and offers you the taste of the action, in an absolute tranquility, beautiful reserve picturesque environment. Dhampus Sarangkot Trek is a Bon voyage. Day 03: Drive from Kathmandu to Pokhara. About 6-7 hrs. Day 04: Drive from Pokhara to Phedi and Trek to Dhampus (1,650 m), 4 hrs. Day 05: Trek from Dhampus to Australian Camp (2,200 m), 3 hrs. Day 06: Trek from Australian Camp to Sarangkot (1500 m), 4 hrs. Day 07: Early morning sunrise view from Sarankot and trek back to Pokhara, 3 hrs. Day 08: Transfer to the International Airport. Meal on full board (breakfast, lunch and dinner) during trekking. All necessary paper works for your trip. Kathmandu / Pokhara luxury Tourist Bus Pokhara to Kathmandu private car. Lunch and dinner Kathmandu / Pokhara. Transfer to the Hotel. Upon your arrival in Tribhuvan International Airport, Kathmandu, our representative from Halesi Treks. Evening welcome dinner at typical Nepali restaurant.Overnight at hotel. After breakfast, we begin the city tour to the UNESCO World Heritage Sites including Soyambhunath, Pashupatinath, and Boudhanath by our tour guide. The day tour is full of fun and unforgettable due to daily activities performed by the local people, devotees, monks, and others. Overnight at hotel. After breakfast, we drive from Kathmandu to Pokhara by Prithvi Highway. It is 200 km west from Kathmandu and takes about 6-7 hours by bus. Along with the rural beauty, following the streams, Trishuli River and Marshyangdi River, we keep on driving piercing the hilly parts observing the towering hills and the forests in both sides. We can have lunch in the highway restaurants. Overnight at hotel. After breakfast, we drive from Pokhara to Phedi. Phedi is 18 km far from Pokhara. It takes about 45 minutes which passes through lovely rice fields and wonderful villages. From Phedi, we climb up through the beautiful forest and villages. After 3 hours walk, we hit the ridge from where the adjacent hills towering seem like the pyramid in many places. The Mountain View from the top is spectacular. The sunrise and the sunset view from Dhampus are astonishing. Overnight at Guesthouse. 3 hours prior to the scheduled flight. If you have enough time before your departure, you could go shopping at the local market.